Buffalo Creek Farms Silver Tabby Babies. 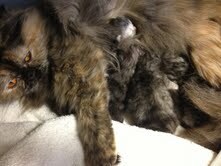 Buffalo Creek Farms would like to introduce Jewel and her 5 new babies. We think there are 3 girls and 2 boys. 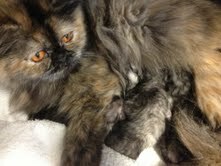 Two of the girls are brown patched silver tabbies or torti tabby's. Silver tabby's are lovely with their contrasting white and black lines. Kind of like white tigers. 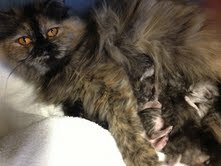 Brown patched silver tabbies a have patches or red through out. With Jewels lovely dark Amber eyes these kittens will be striking. Do you still have kittens?